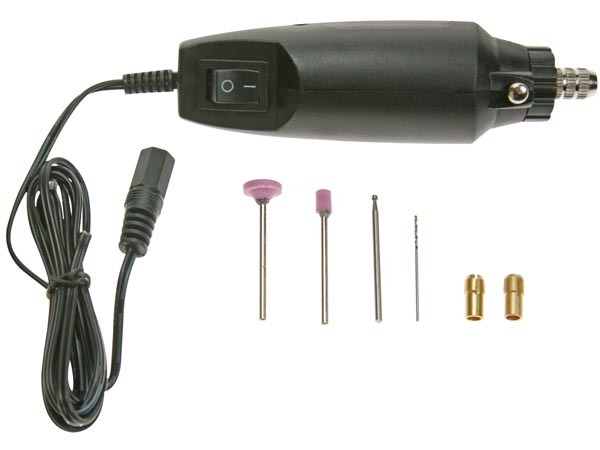 VTHD01 is a low cost 12Vdc drill suitable for PCB work and modelling applications. Requires a 12v Power Supply or similar. Suitable for use with our range of reduced shank high speed drill bits, cutters and grinding wheels. Supplied with three collets (1.1, 2.35 and 3.0mmØ), grind wheels and engraving bits, fitted with cable and 2.1mm DC Socket.